The village of 2,170 inhabitants lies in the valley surrounded by the Somogy hill-country; the name of the village means 'dry valley'. The old village is built by the side of long-distance road No. 7 while the resort area had been developed on the lake-shore. Szárszó is first mentioned in a document of King St. László dated 1082. From the 18th century it became the property of Hunyady earls and started to develop. Establishment of the resort area started with the division of lands into allotments (1904). The railway station of Szárszó is a place of sad memories: Attila József, the poet of tragic lot was run over by a train here in 1937. Attila József Memorial Museum is established in the former house of the poet's sister; the poet lived here in the autumn of 1937. The grave of Attila József can be found in the cemetery of Szárszó, however, today it is only a symbol for the poet lies burried in Budapest. 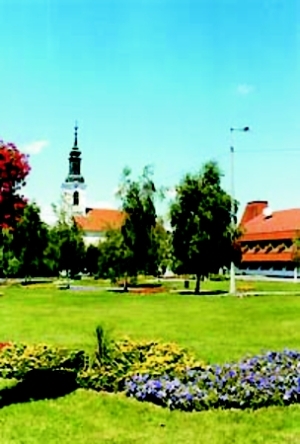 Summer season in Szárszó starts with the Village Day held on May 1st. A popular programme is the three days' patronal feast of Szárszó after Marie-Magdalen's day. A successful programme of high standard is the series of concerts held at the Reformed church. The Szárszó Cultural Days and the traditional two-in-hand carriage driving competition on the row of cellars near Öreg hill are held in August. Exhibitions of fine arts in the hall of the modern building of Lord Mayor's Office in summer. Anglers' lake rich in fish for the lovers of this silent sport at the western border of the village, directly by the side of the long-distance road. Pleasant promenades from the railway station to the vineyards of Öreg hill and Eb hill; Lucs top is 4 kilometres away from here. The thousands of cottages and dwelling-houses, the 39 hotels , pensions and the two campsites give high-standard accommodation for 15,000 tourists. 3 renewed modern free beaches and well-supplied shops await holiday-makers on the 6,5 km long shore. The completely built infrastructure, 250 entrepreneurs of trade and catering provide high-quality service for the visitors.